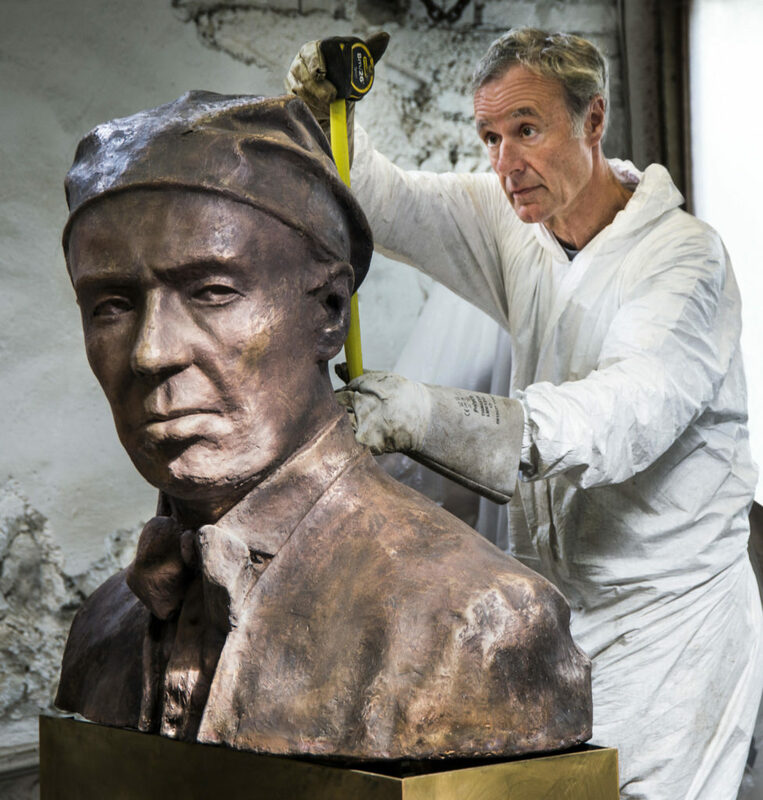 The unveiling of the sculpture by Rowan Gillespie will begin a weekend of celebrations at the Talbot Hotel, Stillorgan, where the statue will be permanently located. Ronnie Wood of The Rolling Stones has been lined up to unveil a statue of the great Irish artist Sir William Orpen in Stillorgan this weekend. Orpen is one of the most revered artists ever to have emerged from this country. Ronnie Wood is a talented artist in his own right and an avid collector and appreciator of Orpen’s work. He will officially welcome the sculpture, by Irish artist Rowan Gillespie, to the South Dublin town, bringing years of planning and fundraising on the part of the Stillorgan Chamber of Commerce to a successful close. William Orpen was born in 1878 in Stillorgan and is famed for his self-portraits and his work as a war artist during World War I. He is to be honoured and remembered in his home town with a weekend of commemorative events which take place on Saturday 15 and Sunday 16 September at the Talbot Hotel Stillorgan. The unveiling will take place at 5:30pm, on Saturday, September 15. Ironically, Orpen himself predicted this honorary sculpture. One of the artist’s famous tongue-in-cheek sketches, entitled ‘A Dream’, sees him standing atop a plinth with crowds of people below grasping to touch the man himself. The sketch bears the caption “I imagine that Dublin has seen fit to honour me.” And so it has come to pass. Irish sculptor Rowan Gillespie is the man behind what is a very striking piece of work. Famous worldwide for his work with bronze casting, Gillespie took inspiration for the bust atop the impressive, 11-foot-tall sculpture from one of Orpen’s famous self-portraits. The smaller, but incredibly detailed bronze sculptures that make up the base of the piece were also inspired by four other notable works by the Dublin artist, including the 'Dream' sketch that influenced the original thought process behind the entire project. Gillespie, whose large and renowned body of work includes the commemorative ‘Famine’ installation at Custom House Quay in Dublin, will be present when his latest work of art is finally unveiled to the public. Following the unveiling of the sculpture, a World War I concert will take place in the Talbot Hotel Stillorgan at 7:30pm, featuring performances from Paul Harrington, Paddy Cole, Zena Donnelly, The Park Singers, the French tenor Damien Top, Cormac Breatnach, Carmel McCreagh, Flo McSweeney and Fiachra Trench, who also happens to be a grand-nephew of Sir William Orpen. The concert is now sold out. The second day (Sunday 16th September) will feature an art exhibition, with a selection of the artist’s work on display from 12-6pm. Dominic Lee, Project Manager of the William Orpen Weekend and coordinator of www.sirwilliamorpen.com, will deliver a presentation entitled ‘The Life and Times of William Orpen’ from 2-3pm. “The realisation of this project is down to the unfaltering dedication of the Stillorgan Chamber of Commerce, Rowan Gillespie, the team at the Talbot Hotel Stillorgan and those that donated generously to the fund,” Dominic Lee said. "On a personal level, the project has been incredibly dear to my heart, so to be able to honour one of our most beloved artists after years of planning and preparation will be a wonderful feeling.